Free agent CB Byron Maxwell returned to the Seahawks Friday when he signed a one-year deal. He started the final six games of 2017 replacing Richard Sherman. The Seahawks took care of another personnel vacancy by re-signing CB Byron Maxwell Friday, according to NFL.com. The one-year deal is worth up to $3 million with incentives. Maxwell was re-acquired in November after Richard Sherman’s season ended with an Achilles tendon injury, and was subsequently released. 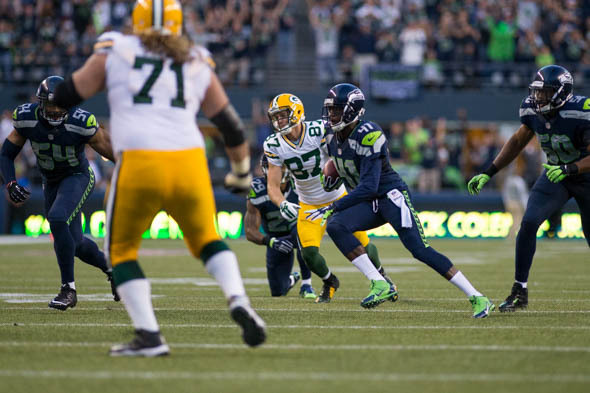 The Seahawks have under contract the three corners who finished the 2017 season — Maxwell, Shaquill Griffin and slot corner Justin Coleman, the latter retained after he signed the Seahawks’ tender as a restricted free agent. Maxwell played in the final seven games, starting six. Maxwell was with the Seahawks from 2011 to 2014 before moving on in free agency to Philadelphia, then Miami. The Dolphins cut Maxwell after two games in 2017. The NFL draft resumed Friday with rounds two and three. The remaining four rounds are Saturday. The Seahawks have one pick so far Friday, No. 76 in the third round, acquired when they traded down Thursday in the first round with Green Bay. Obviously it became critical to sign Maxwell after the Seahawks passed on drafting CB Jaire Alexander by trading that pick to the Packers who took him. Our secondary is exactly what we ended last year with, not a bad deal, I think they played better than most people gave them credit for. Starting LB may have improved with the faster Mingo taking the Strong Linebacker spot. The defensive line is where the concern is; I’m not sure the replacements for Richardson and Bennett will match the production in pass or run defense which makes it harder on both the LB’s and the DB’s. Some forget that the defense in December held the Eagles to 10 points, But that’s understandable, since the next week they gave up 42 to the Rams. Maxwell probably isn’t an average NFL starter, but he’s not terrible. He’ll look a lot better if the D-line is improved along the lines of your suggestion. With 7 CB’s on the roster if the Hawks draft one tomorrow that could have ended Maxwell’s Seahawks and possibly NFL career so he probably figured it would be best to accept the offer the Hawks had on the table before that happened. He’s still a serviceable DB though not the same as he was a few years ago. I thought possibly Dallas might have shown interest in him.